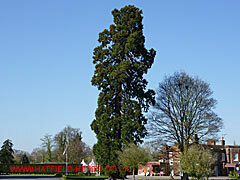 Specimens of the world's largest tree species can be found growing in and around Hatfield. While they may already tower above other trees these are relative youngsters – only having been introduced to Britain in the mid-18th Century – and nowhere near their full size. Younger people know them as the giant trees used as the backdrop for the 'Forest Moon of Endor' – home to the Ewoks in Star Wars: Return of the Jedi (although some were props or digitally enhanced). Older folks will probably recall iconic pictures of the Wawona Tunnel Tree with a Cadillac automobile in the mouth of the tunnel. The tunnel through the tree was cut in 1881 and was big enough to fit a wagon and horses – somewhat reminiscent of England in 1724, when the first Duke of Portland had his woodmen cut a tunnel big enough for a coach and four horses in the Greendale Oak for a bet. While it was the Coastal type that was introduced to Britain first, it was the Giant Sequoia that became a huge hit with the Victorians as the 'Wellingtonia'. Ultimately, they were planted in the grounds of most stately homes. So it's no surprise that they can be found growing today in the grounds of Hatfield House, Bush Hall, and the Old Rectory. The story of how these giants of the tree world came to Britain offers a fascinating insight into the past. Although the story is by no means straightforward with a number of conflicting accounts. Indeed, from their classification to their naming the story is something of a maze (the Giant Sequoia alone had thirteen scientific names before it was finally decided as Sequoiadendron giganteum. While it has common names linked to three different national heroes and the one that stuck is probably the least well known – See 'What's in a name' below). However, the tale of these tall trees is entwined with some of Britain's botanical and horticultural greats. People who lived lives as impressive as the trees they discovered and brought back to Britain. Although, some were not always as upright as they might have been. But it's human to err. Incidentally, botany is the science of plants – their physiology, structure and distribution; horticulture deals with growing them in gardens. Two of the giants growing in Hatfield – seen from different distances so it's not clear whether one is taller than the other – both are thought to be Giant Sequoias (and still in their infancy). The one on the left is at Bush Hall (also shown in the picture at the top), the other at the Old Rectory. Both were 'in bloom'. A third can be found at in the West Garden of Hatfield House (with what appears to be a Coastal Sequoia in the pinetum (plantation of conifers) in the arboretum (tree garden). However, there were reports of a Giant Sequoia in the arboretum but it's not clear whether it has survived. Initially thought to be the same species, there are actually two distinct species of American Redwood / Sequoia – Coast Redwood (Sequoia sempervirens), and Giant Redwood (Sequoiadendron giganteum). Both are closely related and are native to America's Pacific coast. 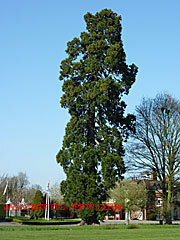 However, there is another smaller Redwood found in China – Dawn Redwood (Metasequoia glyptostrobides), which has also been introduced to the UK, but much more recently than its American cousins. Oddly, the Giant Redwood and the Dawn Redwood have 11 chromosomes in their reproductive cells but the Coast Redwood has 33. While the Coast Redwood is considered to be the closest relative of the Giant Redwood, genetically the Coast and Dawn Redwoods are closer – leading to theories that the Dawn Redwood may be a descendant of the Coast Redwood. However, European nursery breeding programmes led to the discovery of variations, like the Weeping Sequoia (Sequoiadendron giganteum 'pendulum') and Golden Sequoia (Sequoiadendron giganteum 'aureum'), so it is possible they are prone to mutations. The Horticultural Society of London was founded in 1804 by Sir Joseph Banks and John Wedgwood. It sowed the seed for the flower shows of today with a series of floral fetes at Chiswick that started in the late 1820s. A financial crisis in the 1850s resulted in the sale of the society's library and a period of decline. Thanks to the efforts of Prince Albert, who was the society's president, it was granted a charter in 1861 and became the The Royal Horticultural Society (these days shortened to the RHS). A new garden and headquarters was established in Kensington (which remained its base till 1888. Its spring show eventually moved to its current location – the grounds of Chelsea Hospital – in 1913. Today, it is known worldwide as the Chelsea Flower Show). On 24 June 1861, Queen Victoria planted a tree in honour of the rejuvenated society at its South Kensington home. According to a report in The Times she had intended to do so at the inauguration on 5 June but had been unable to make it, so Prince Albert had planted a tree on that occasion. However, this was a public demonstration of her support – and the tree she planted was a Wellingtonia, supplied by none other than James Veitch & Sons. James Veitch was present as one of the members of the Society's council, and Her Majesty reportedly presented the shovel she had used to his son, James Veitch Jr. In another interesting footnote, in 1866, the Society rebuilt its library by buying the collection of John Lindley, who edited The Gardener's Chronicle (which published the news of the Giant Redwood's discovery and details). The Giant Redwood (Sequoiadendron giganteum) was introduced to Britain a decade after its taller relation Coast Redwood (Sequoia sempervirens) in 1843. Yet it caused far more of a sensation. Circumstances and the marketing acumen of Veitch nursery is given credit for the different reception given. Arthur Wellesley (born Arthur Wesley) was a successful British general with successful campaigns as far afield as India and France. He is best known for defeating the Emperor Napoleon at the Battle of Waterloo (aided by the Prussians under Blucher). He later served as Prime Minister, which is when he became known as the 'Iron Duke' – for putting iron shutters on the windows of his home Aspley House (also known as No.1 London) to prevent them being smashed by angry crowds. He also wasn't popular with some in his own party for forcing through the Catholic Emancipation Act of 1849. All appears to have been forgiven following his death in September 1852 and the nation mourned his passing. 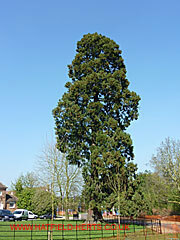 The following year, Veitch introduced the Giant Redwood to Britain under the name Wellingtonia – in his honour (although it was actually botanist John Lindley who named it). The idea of an arboreal memorial proved a huge success in Britain (people are also likely to have been influenced by Queen Victoria's planting of a specimen). However, naming the tree after an English hero raised the hackles of the California Academy of Sciences which had intended to name the great North American tree in honour of a great American – George Washington (using names like Taxodium Washingtonianum; Washingtonia Californica; and Washingtonia Americana). Their annoyance was fully justified not least because Veitch's plant collector only learnt about its existence through their good offices. However, there was a twist in the tale – the name Wellingtonia had been used for a species of plant in 1840, which meant under the naming rules it couldn't be used for the tree. In total, the Giant Sequoia had some 13 different scientific names before it was established as Sequoiadendron giganteum. The name Sequoia is generally said to relate to a Native American hero Chief Sequoia (also spelt Sequoyah) credited with devising a written alphabet for the Cherokee language. However, like most things associated with the tree the truth appears to be more complicated. He did not hold the title of Chief, also he was of mixed race – his father was a German immigrant according to one source (while another source suggests a British trader called Nathaniel Gist). His mother was a Native American belonging to the Cherokee tribe. Even today, the US National Park Service tends to call the tree Giant Sequoia, while the US Forest Service favours Sierra Redwood. And some people in Britain still use the name Wellingtonia. More information on the movement of people and plants, and the story of how these giants of the tree world came to be growing in Britain.